This little bottle of perfume came in a set of three, all cute and mini. 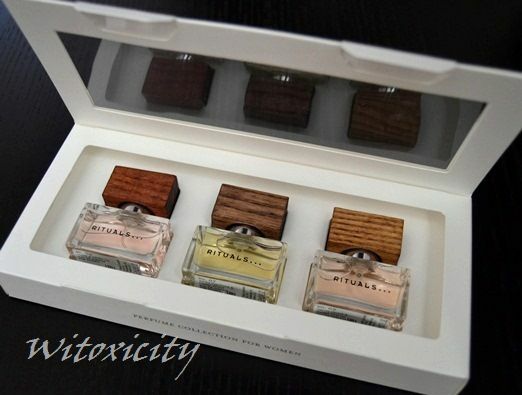 Rituals Cosmetics released two perfume giftsets last month - a Perfume Collection for Women and a Perfume Collection for Men - each consisting of a selection of three 10ml bottles of Rituals' perfumes. Each box retails for €24.90. I'll be doing little features on each of the perfumes in the women's boxset which I bought last month. I'll start off with No. 09 Vanilla Drops + Sweet Orange (bottle on the right in the box). 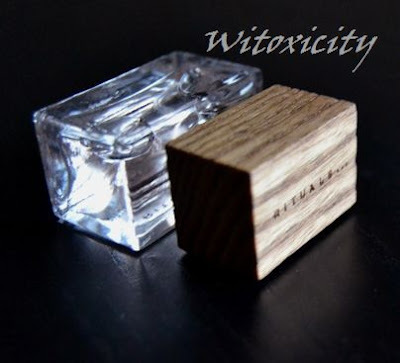 When Rituals launched its range of perfumes last year, they said in its press release that this perfume No. 09 was inspired by soul songstress, Joss Stone. It seems that the founder of Rituals, Raymond Cloosterman, met the singer backstage after her concert and she mentioned that she loves mixing orange essential oil with vanilla to create her own unique perfume. So, there! I like Joss Stone's style but I don't care much for name-dropping and celebrity-related/-inspired/-created scents. 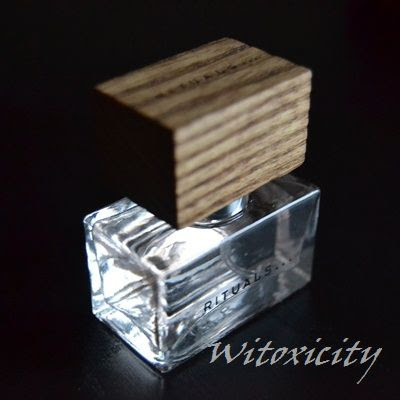 I just thought you should know how the idea of this perfume came about. Imagine a warm, starry night in magnificent Marrakech...where sparkling facets of the Orange tree contrast with the sensuality of precious Vanilla Drops. An oriental, fruity, sensual fragrance. No. 09 starts off with a citrus explosion: orange, fresh, loud but not tart. The vanilla creeps in a couple of minutes later to tone down the perkiness of the orange. The citrus accent recedes further and further into the background as the roundness and heaviness of the vanilla takes full control. Somewhere in there, there is also a hint of what I think is cardamom. No. 09 dries down to an extremely powdery vanilla. I like the opening - the scent is happy and pretty, like a gleeful fresh-faced girl - but unfortunately, it goes downhill from there. That happy girl becomes a squat middle-aged lady with too much rouge on her cheeks. No. 09 is not quite my cup of tea. The Rituals No. 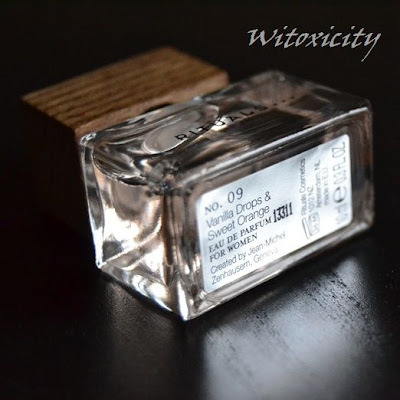 09 Vanilla Drops + Sweet Orange EDP is also available in full-size 50ml bottles (Price: €39.90 - the full-size bottles have the same rustic wooden caps) and in travel-size 20ml sprays (Price: €14.90). I love the scent of vanilla and that of orange. I don't know about a mix of both, never smelled it. Great post hun. Still curious about the scent of these perfumes. Eww! Powdery vanilla! D:! Frumpy old lady alert!!! (O=o=O)/ <-- Frumpy old lady... with too much rouge :p! Okay, all kidding aside, I don't think I'd like this either as powdery anything are not my cup of tea :x. Too bad, as orange and vanilla sounds like a fun combo otherwise :/.